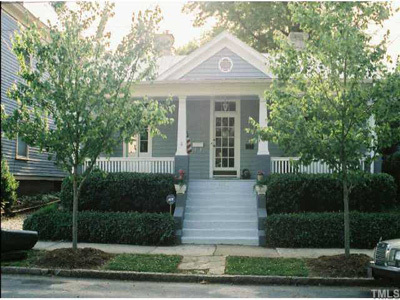 This 1879 Victorian cottage is surrounded by new and old homes in the Historic District, all located a few blocks away from downtown and the State Capitol and museums. A two-tiered Georgetown garden with a hot tub, an open family room kitchen, a true master suite, are just some of the features of this 1879 home. Completely rebuilt in 1993 by the Oakwood neighborhood association, the home retains its old house character with a center hall floor plan and 4 decorative fireplaces. For rental information, contact Gail Weisner by phone 919-247-5183 or email gwiesner@nc.rr.com.